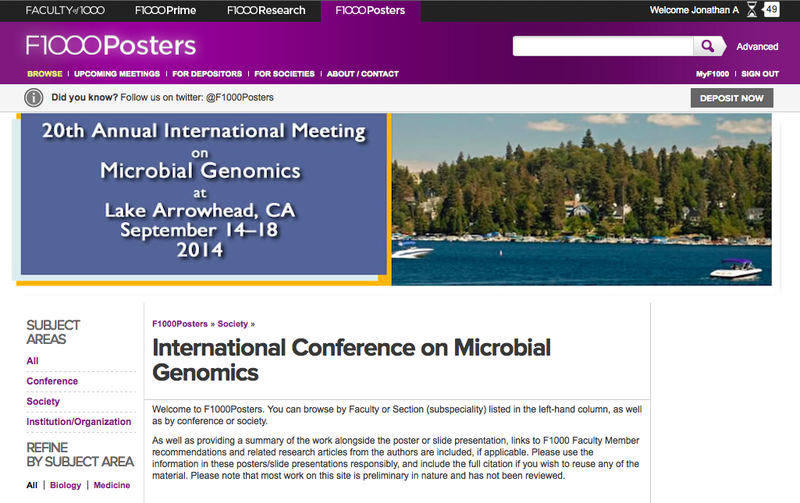 Lake Arrowhead Microbial Genomics 2014 (#LAMG14) F1000 Site w/ Posters and Talks – microBEnet: the microbiology of the Built Environment network. Well, the Lake Arrowhead Microbial Genomes meting ended one week ago. And it was a great meeting. I am writing up some reflections of the meeting which I will post in a few days. But for now I thought I would post a little note that I am experimenting with a new (for me) approach for sharing talks and presentations from meetings. This approach is to take advantage of the Faculty of 1000 (F1000) Posters system which allows free publishing of slides and posters. There are of course many ways to share posters and talks from meetings. I usually post slides to Slideshare, which I like quite a bit. And I record video slideshows (slides in synch with Audio) and post those to YouTube. And for posters we have been depositing them in Figshare. All of these are great options. And I love experimenting with various sharing plotforms to see how they can be used for science. Apologies in advance for the long email – the email can be summarized as follows: if you are giving a talk or a poster at the meeting F1000 has set up a site to publish these if you want to. * People outside the meeting can see your work. * There is an official “record” of your presentation that can be useful in things like grant reports and for CVs and such. * This is a way for people at a meeting to share posters and talk slides with each other in a relatively easy manner. * If we are able to get a decent number of posters and talks on F1000 it might be a way of helping draw attention to the meeting, which in turn could get more people looking at the posters and talks and also might help with fundraising for next meeting. * Some journals will not consider for publication material that is in published posters or slides. This is rare as many journals have announced that such poster/talk sharing is OK. In general, prepublishing posters or slides is considered OK for anything published by Nature and Springer and PLOS and BMC and the Royal Society and CSHL and PeerJ and PNAS and Individual Journals like eLife, Genome Research, G&D, MBE, and more. But there are a few holdouts. Some more information on such policies can be found here: http://en.wikipedia.org/wiki/List_of_academic_journals_by_preprint_policy. * The whole world will have access to the poster and slides published on F1000Posters. I like such wide reach. But this makes some people uncomfortable. * If you have preliminary results that you do NOT want people to see outside of the meeting, then this is not for you. I personally believe that the benefits far far outwiegh the drawbacks. We have gotten enormous value from posting slides and publishing posters. But this is not meant to pressure people in any way to do this. If you are willing and interested, check out the F1000 site http://f1000.com/posters/browse?societyId=265053653. If you are not interested, that is completely fine. And as of now, there are eleven presentations there. Not as much as I would hope for in the long run. But not too bad. The systems for F1000 posters could stiull use some work but the F1000 people seem very willing and interested in beefing it up in various ways. I think I will be trying to use this for other meetings I am organizing or participating in.